A health and fitness writer since 2008, Aaron Matthew specializes in writing about health, fitness and mental performance topics for various websites including LIVESTRONG. He holds a Master of Arts degree in kinesiology from San Jose State University. 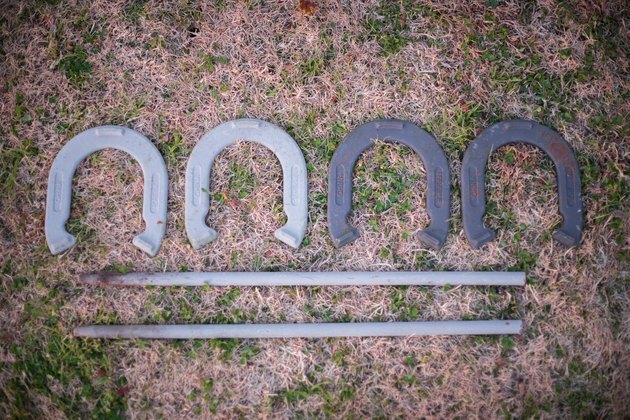 With only two metal stakes and four horseshoes, you can play a game of horseshoes with your friends and family or even participate in an official tournament. 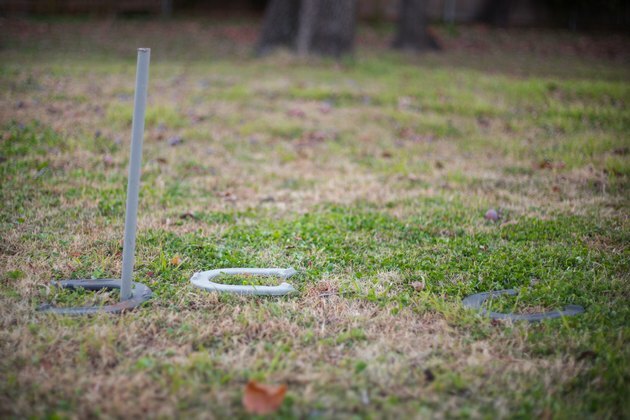 In this game, the object is to throw your horseshoes closest to a metal stake. 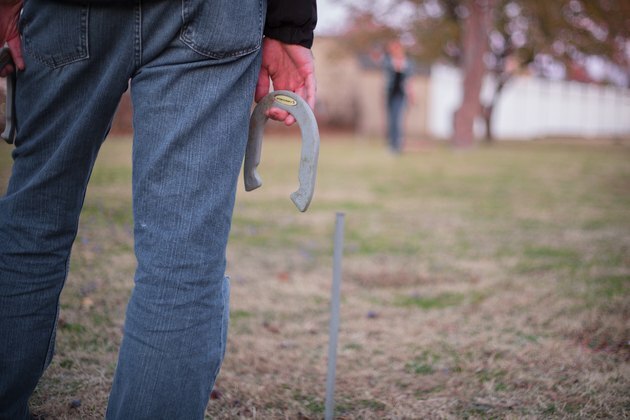 The National Horseshoe Pitchers Association provides rules and regulations on the correct distance for playing horseshoes. The entire horseshoe court should measure 50 feet in length. The 14-inch metal stakes you pitch the shoes at are 40 feet apart from each other. The National Horseshoe Pitchers Association states that men throw from no closer than 37 feet, while in women's tournaments, the competitors pitch from 27 feet. Those under age 18 also throw from 27 feet away. Each player gets two horseshoes. The first player pitches both shoes, one at a time, and then the other player pitchers her two horseshoes. After all four horseshoes have been thrown, you have completed one inning. Walk to the stake and score the shoes for that inning. The pitching order switches after every inning. You can play horseshoes until you reach a certain number of points, or complete a predetermined number of pitches. The Sports Know How website explains that regulation games are played to 50 points while informal games are usually played to 21 points. 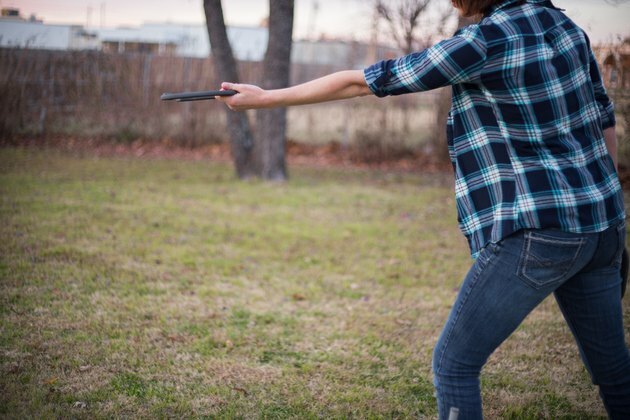 Your score in horseshoes depends both on your pitch, and your opponent's. Throw a ringer, where the horseshoe circles the stake, and you score three points. However, ringers from opposing players cancel out, so if you opponent also scores a ringer, then neither of you receives points for those throws. If there is no ringer from either player, one point is awarded to the horseshoe closest to the stake. If you throw the only ringer in the inning and also have your other shoe closer to the stake than either of your opponents, you receive three points for the ringer and one point for the closest horseshoe.